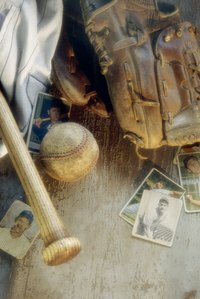 If you collect baseball cards, you can display them proudly in your home. You can purchase a baseball card display case online or in sporting good stores -- but it is often cheaper to construct one yourself. This kind of case can also make a wonderful present for the card collector in your life. Measure the wall you plan to put the display on to determine how big a display you can place there. Lay out the baseball cards you intend to put on display on a piece of plywood. Measure the length and width of your intended display to ensure it's not too big for the wall. If it is, remove some cards or find a different wall to house your display. Remove the cards from the plywood. Draw a rectangle on the plywood to indicate a display of the size you have chosen. Cut the plywood along the lines you have drawn to make a board of the correct size. Paint the board if you want a colored display and let the paint dry. Cover the plywood with felt. Glue the felt to the plywood with a special adhesive strong enough to hold felt to plywood. Arrange the baseball cards the way you want them. Put each card in a plastic sleeve. Put a removable Velcro strip on the back of each sleeve and a corresponding Velcro strip on the felt where you want it so that you can attach the cards without gluing them to the felt and ruining them. Place the sheet of Plexiglass over the display. Put a wood frame around the Plexiglass and nail the frame to the Plexiglass and to the display. Attach the display to the wall with an adhesive strong enough to hold wood and glass.